The U.S. National Whitewater Center has launched "The Endless Summer" video contest, encouraging you to submit videos and photos of your best adventures at the Whitewater Center. The grand prize winner will receive a private party on Saturday, August 29 at the center for him or her and 10 friends with food and refreshments. The party will also include AllSport passes for the winner and guests to enjoy the activities--kayaking, rafting, rock climbing, biking, zip lining--at the USWNC. Videos or photos can be uploaded until August 13 at www.uswnc.org/party. The USNWC is looking for anything from edited masterpieces to rough-cuts. Everyone can vote for his or her favorite videos online. A weekly prize will be awarded throughout the summer to videos chosen at random. At the end of the contest, the five videos with the most overall votes will be entered into the finals. The grand prize winner will be selected on August 20. 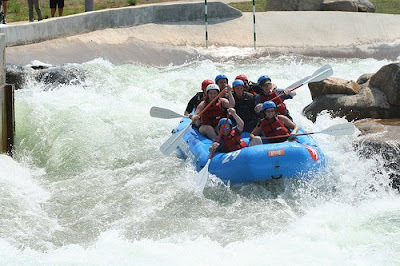 The U.S. National Whitewater Center is located at 5000 Whitewater Center Parkway in northwest Charlotte, along the banks of the Catawba River. The center is open year round and hosts several special events and programs during the summer, including the popular Subaru River Jam each Thursday.